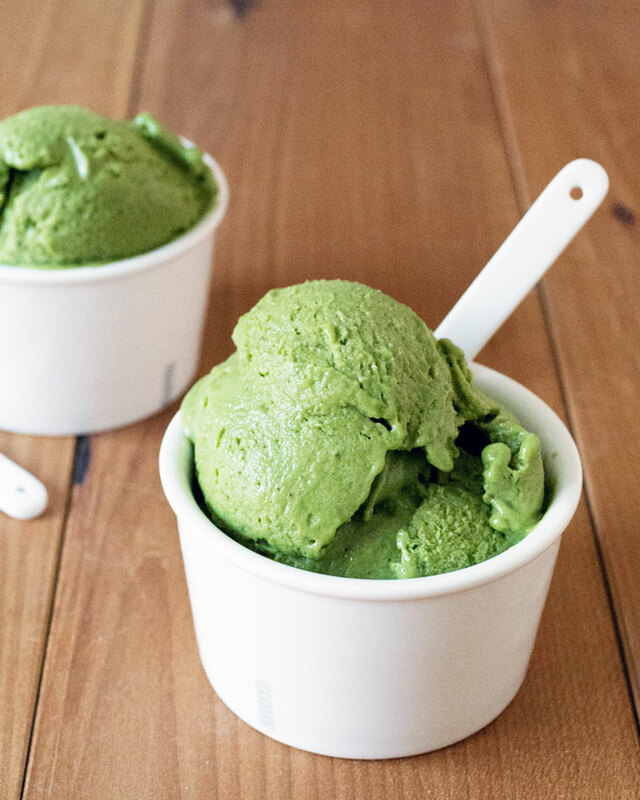 This matcha banana “ice cream” looks deceivingly like the real thing. 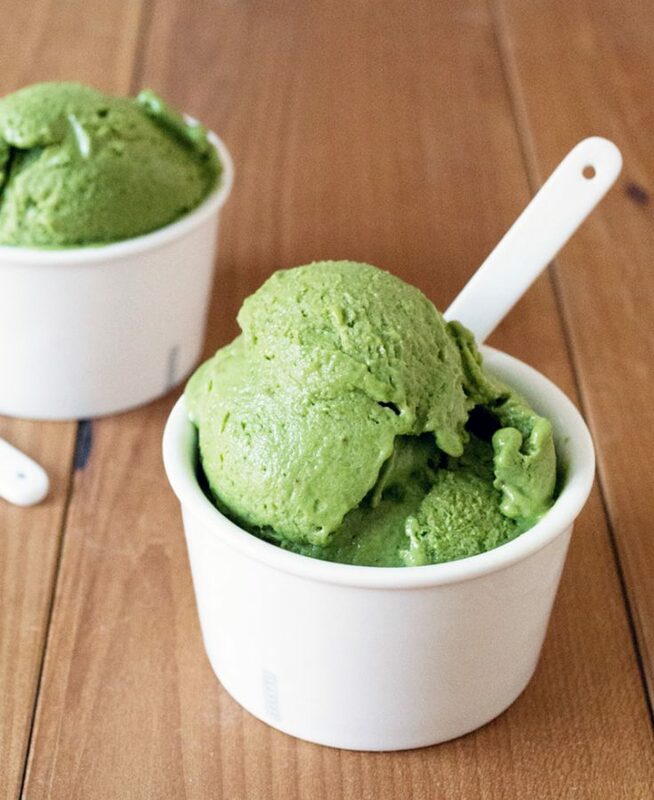 Frozen bananas, matcha green tea, and a little something sweet are all you need for this “nice cream” recipe. If you’ve been on a food blog or Pinterest AT ALL, you’ve probably seen the very popular one-ingredient ice cream made from frozen bananas. Also known as “nice cream,” I gave it a green twist by adding matcha green tea and a little sweetened condensed milk. If you’re looking for a healthy dessert, this is it! As a rule of thumb, the brighter the green, the better the quality. 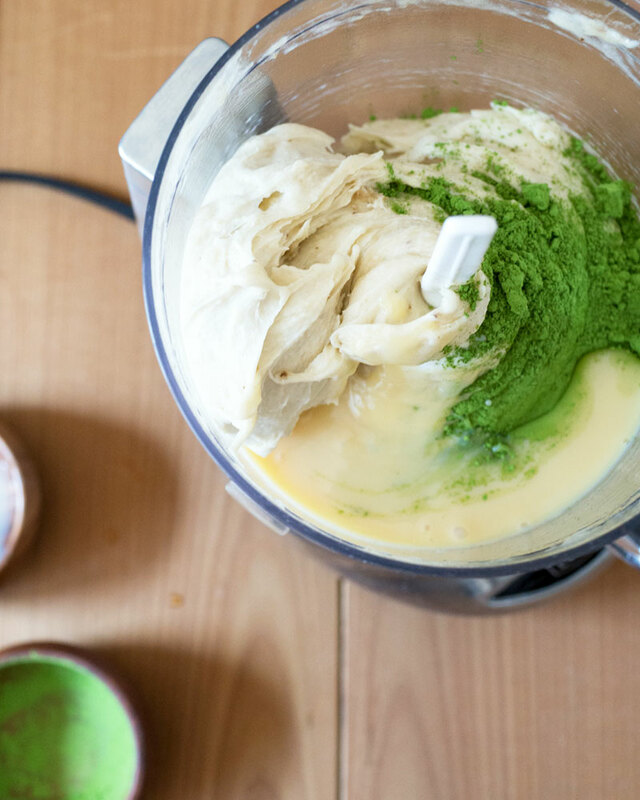 For this recipe, get matcha in the $15 – $30 range. I used condensed milk to sweeten but you can always just replace that with honey or sugar. A powerful food processor makes it super easy. I got mine from my last trip to Italy but you can use a ceramic ramekin and gelato spoons for a similar look. First, let me say that it tastes NOTHING like ice cream. So get rid of that pipe dream of thinking frozen bananas are magically going to taste like Haagen-Dazs. What does it taste like? Sweetened banana with matcha that has the consistency of ice cream. (Which is a good thing if you like bananas and matcha.) The consistency is the real secret into fooling everyone into thinking it’s ice cream. Even better, SOFT SERVE ice cream. Fool me once with that mashed cauliflower that they swear tastes like mashed potatoes but tastes exactly like mashed cauliflower. It was a lot of fun watching the frozen bananas turn into what looks like soft serve ice cream. It’s really does look exactly like soft serve. The frozen bananas are pretty hard so I may have seen a little smoke come out of the mini food processor as I was trying to soften the bananas initially. I would go with a regular food processor instead of the mini if you don’t want to start a small kitchen fire. You can eat it as soon as everything is well blended, but I refroze for an hour and a half to harden it up a bit. With a mini food processor, let the frozen bananas thaw for a few minutes so they’re not rock hard. You’ll need to stop the food processor a couple of times to scrape down the sides. If you want to be even healthier, skip the sweetener. Or use it as a topping so you can adjust the amount of honey or condensed milk. If you want to get fancy, top it with diced strawberries, blueberries or toasted almonds. 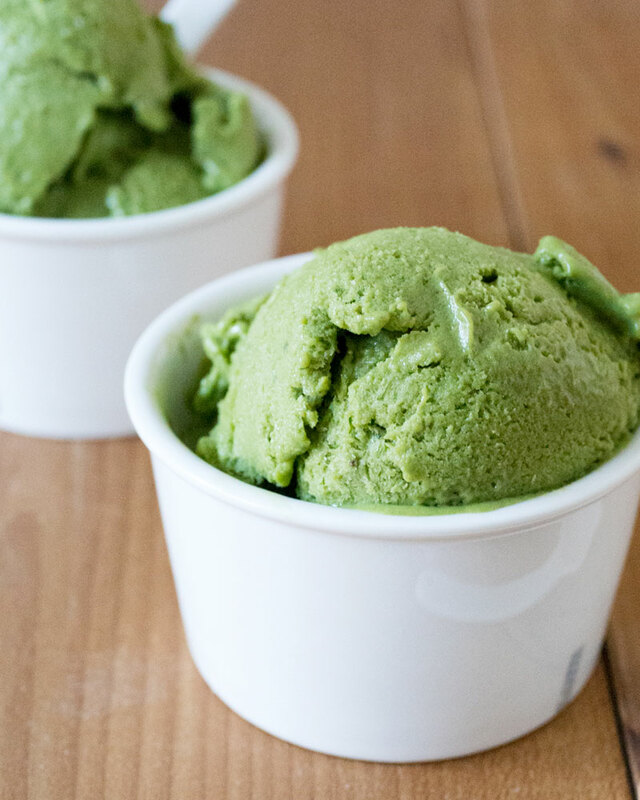 Matcha (Green Tea) Banana "Ice Cream"
Super easy and healthy "nice cream" treat! 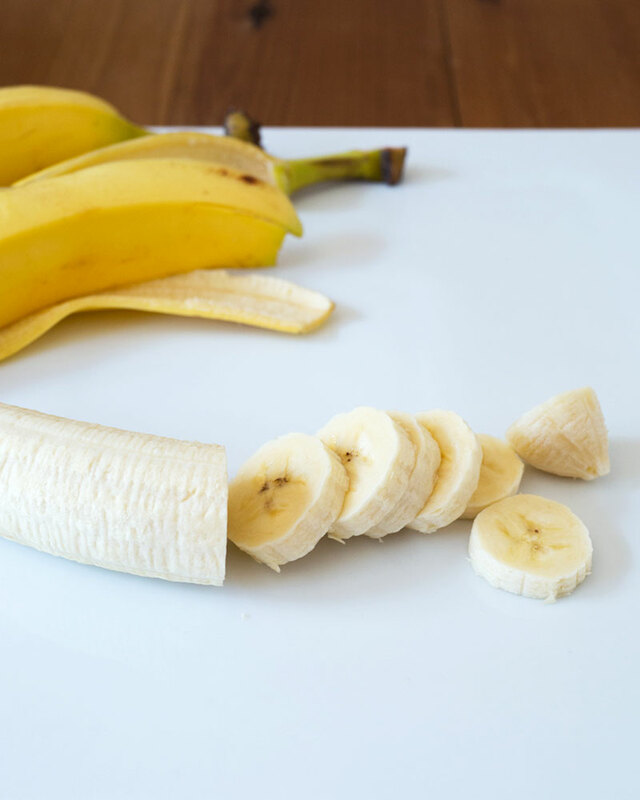 Cut bananas into little small pieces and freeze for at least 3 hours or overnight. 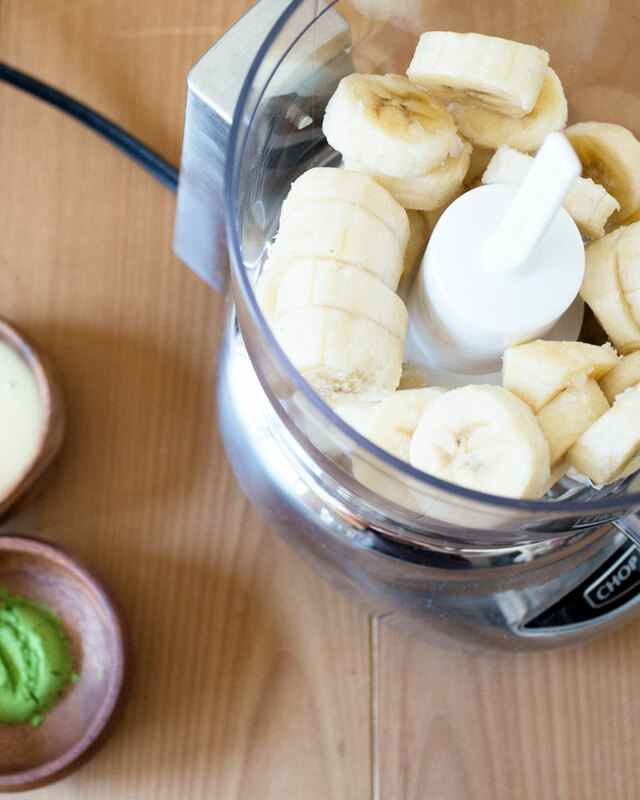 Using a food processor, blend frozen bananas until it looks like mashed potatoes. 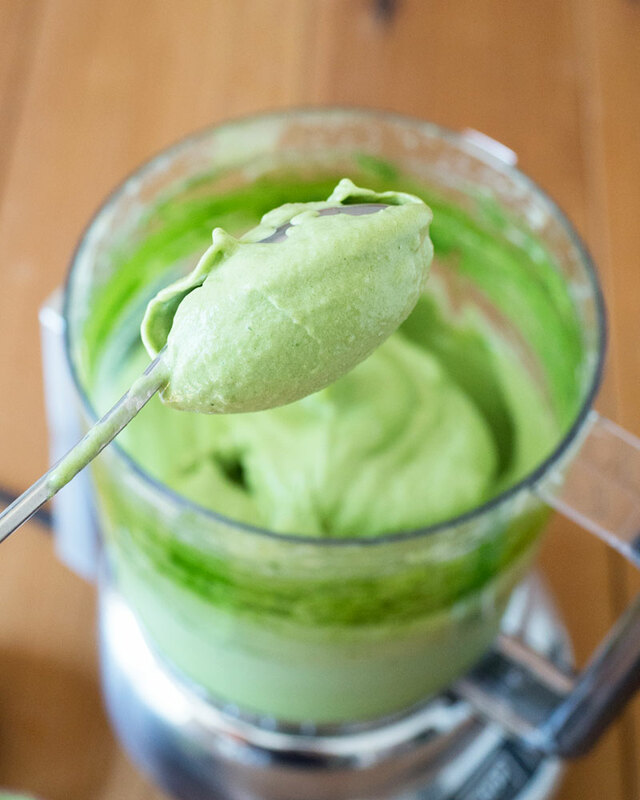 Add matcha and sweetened condensed milk and blend until it looks like soft serve ice cream. Can be eaten as is, or can be transferred to a container and frozen again for at least an hour and a half for a harder consistency. Could this recipe be an simpler? I’ve definitely seen the one ingredient ice cream craze that you mentioned but I’ve never given it a try. This version sounds super easy and I love that you added matcha it. Even better is that it makes only a few servings. I like that since I’m likely to be the only one eating it in my house (the boyfriend hasn’t learned to like matcha…yet!). Hi Nicole, give it a try! It is super easy and tasty to boot, especially for us obsessed with tea and matcha! Wow! Genius thinking =) I love how you came up with this mixed up! Matcha is such a healthy one, there are many health benefits that you can get with this. I hope I can find this in some of the hong kong restaurant and bar! Since I don’t have enough time to prepare it own my own. Hi Lea, hope you can find it too! Agree that it’s a great combo of healthy and tasty. Excited to try this great recipe! Thank you! 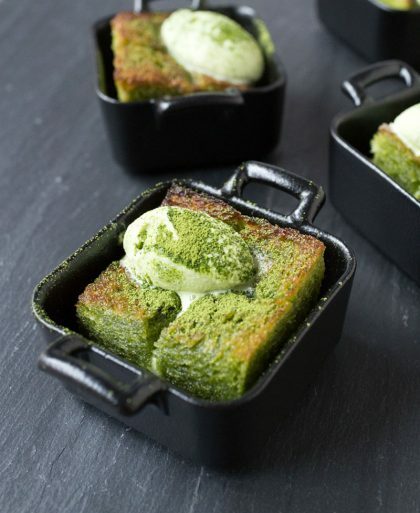 I’m a HUGE fan of all things matcha and this just looks simply delicious! I will be trying out this recipe in the near future for sure. So glad that it doesn’t require an ice cream machine or heavy cream. Thanks for sharing this awesome recipe! Can you use condensed/canned coconut milk as a sub for the dairy free folks? Hi Krystal, I don’t see why not! The condensed milk was mostly to sweeten so feel free to swap it with another type of sweetener. Matcha banana for sunny day! Your recipe looks delicious and easy to make.Can we use Vanilla ice cream instead of condensed milk? Hi Veronica, this recipe is for people that don’t want ice cream in the recipe, but if you would like, sure, go ahead and add any sweetner that you wish including vanilla ice cream. LOL! They fooled me as well with the cauliflower ‘mashed potatoes’ happy I’m not the only one.. can’t wait to try this recipe! Hi Teena, haha, we were so easily fooled! Rather than using a food processor, how do you think this recipe will work with an immersion blender? Hi Lorraine, you can definitely try it with an immersion blender but it may be a bit harder to blend everything evenly before it gets too soupy. Hi T, you can take out vanilla extract from the recipe if you prefer. I just made this– wow. I am amazed by how easy and delicious this is. I too ended up adding sweetened condensed milk, though if I’d had it on hand I would have added sweetened condensed coconut milk or just coconut cream. The texture is exactly as advertised– very soft-servey. Even without the matcha, the bananas and sweetened condensed milk combo would make a great base for other flavours, like vanilla, chocolate, almond, etc. Thanks for the great recipe! Hi Jocelyne, so happy you loved it! !